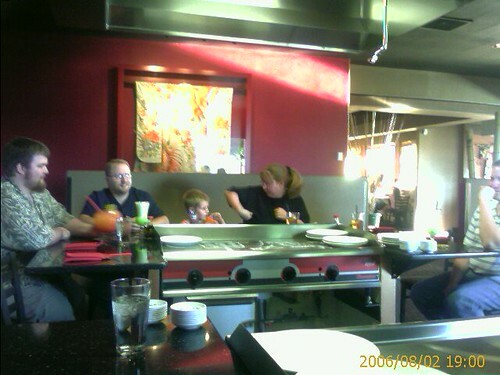 We had a good night out today at “Kabuki” on West 11th. Some of the guys ordered some “questionable” drinks, very very fruity cocktails. I made a couple of crude jokes about it. I won’t print them here, why offend? I don’t think this picture doe these drinks justice, especially Adam’s giant two-hander of fruit. I had a nitegirl, the spawn and I had a great time and I think we will all go out again. Check out my new Laptop. 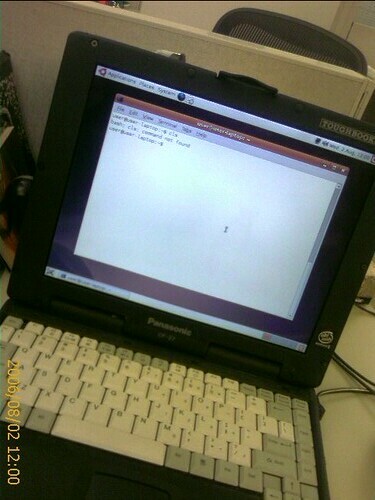 This is a P2 Mobile (300mhz) Toughtbook! Pull a ghost image from an already installed ubuntu onto the drive. Thanks Shawn for the ghost help! Thanks Ben for the image! After some fiddling with X it is up and running!!! What is your current computer desktop image? Let’s see it! My main desktop is blank, a blank black screen with a recycle bin on it. Not very exciting. I recently re-imaged that box and made the decision to keep the desktop clear. My older PC had images pulled from flickr with the tag “toronto” auotmatically placed on it by “John’s Adverntures” wallpaper tool. That Pc is in use by my daughter, so I don’t think I will post the image of shrek that lives there now. My work laptop has the same going for it, but since it is my work laptop, I cannot post an image from it anyway. Checking in with a burning missive about late night calls and comcast service. Our DVR from comcast has been on a slow decline for ages, with the “second” tuner being non-operable for months now. Last night the main tuner stoppped behaving and prompted me to call in Comcast. The Comcast tech was polite and prompt but could not fathom what I was saying “I’ve never heard of this” was about the best she could say. Anyway, after unplugging and re-plugging the box and cables she decided that a tech visit was in order. Let’s hope they bring a new DVR and a signal booster with them.